Successfully Added Wireless Headphones + FM Transmitter to your Shopping Cart. Wireless Audio Gadget - A high fidelity, light and comfortable wireless headphone for high quality wireless audio from your computer, FM radio or any 3.5 mm personal device, plus a USB audio transmitter that works from USB port of your laptop/PC/netbook/etc. This ultra-comfortable wireless headphone is extra cushioned for superior comfort and absolute isolation from the rest of the world. It perfectly envelopes your ears to shut out everything else and let you enjoy an enriched audio experience that is available only to you. - Turn off the speaker and pick up your wireless headphone so you don't wake up your family in the middle of the night with the screaming and gun shots from your game. Even when wireless is not possible, you can still use this high quality headphone with your favorite personal devices such as: MP3, MP4, CD/DVD player, gaming consoles, PSP, NDS, iPhone, iPad, etc. 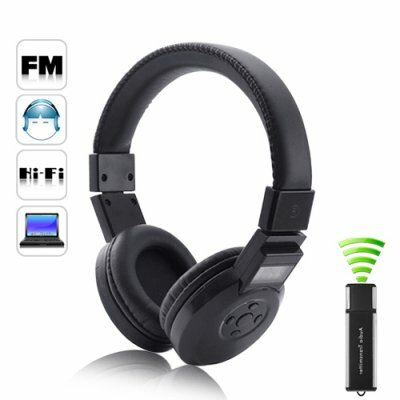 Your can even search and listen to the best FM radio stations with this wireless headphone without disturbing others. This wireless audio gadget is in stock right now and available with our hard-to-beat wholesale price. Order yours right now and a couple more for your friends, relatives and to sell on internet storefront. Brought to you by the original China electronics wholesaler - Chinavasion. Will the wireless headphones instantly reconnect when you walk far enough from the receiver and lose the wireless connection?